Period advertising for TEAL's Solent service of "The Coral Route"
The Museum of Transport and Technology (MOTAT), located in Western Springs, Auckland, New Zealand has recently gotten it’s massive Short S.45 Solent 4 ZK-AMO “Aranui” under cover in it’s new 32,000 square foot Aviation Display Hall, where it towers over the rest of the assembled collection. 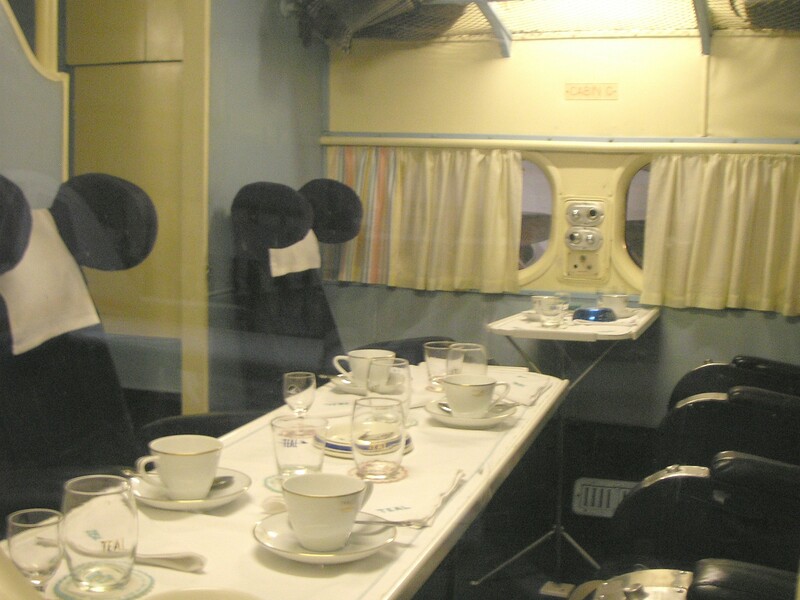 This flying boat was in regular commercial service with Tasman Empire Airways Limited (TEAL) until 1960, transporting 45 passengers in spacious luxury unheard of these days. Luxurious accommodations on display within Aranui at MOTAT. The Short Solent was the last flying boat to be developed by Short Brothers, plc in the late 1940s and represented the pinnacle of luxury flying boat airliners, providing the well-heeled the last word in luxurious air travel on a plane that boasted two decks and an onboard chef who cooked meals to order. 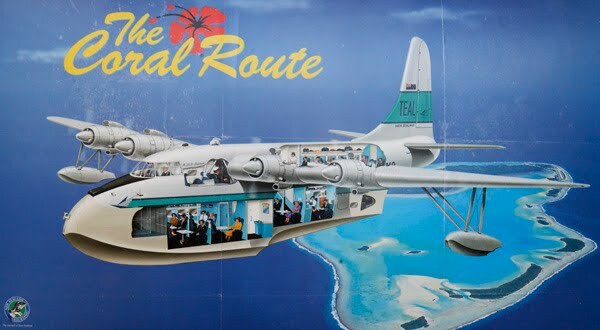 ZK-AMO “Aranui” was the last operational Solent to fly the iconic ‘Coral Route’, serving Auckland New Zealand, Fiji, Samoa, the Cook Islands, Tonga and Tahiti, outlasting its other TEAL flying boat fleet-mates who had been supplanted by land-based aircraft in 1954. “Aranui” will continue to undergo restoration and conservation work, including a complete refit of its plush interior to the standards under which she served her passengers during her heyday. Another massive Short Brothers flying boat, a Royal New Zealand Air Force Sunderland V NZ4115 is under restoration outside at MOTAT and will be joining “Aranui” indoors out of the weather once restoration work on its wings has been completed. Without any sufficient quantities of all natural predators in the area, the speed of beaver proliferation has greater during watersheds inside the neighborhood. “We’re looking forward towards the future attempt in a transplant,” he explained. Many of the more mature students are mothers whose young people have absent off to school or have flown the nest. Olga High quality 17yearold daughter gave her the press she required to enroll. Coppejans turned only the next Belgian boy ever to earn a Grand Slam title because of a 61 sixty four earn about Filip Peliwo of Canada, whereas girls’ No. two seed Beck arrived back to defeat Anna Schmiedlova of Slovakia 36 75 63. First, make sure that you look into the different claims made by system manufacturers, and compare them to various user reviews that you will be able to find on the internet. A few years ago a family came to live with us. And then the hotel manager as well . John Moson Coege Of Sale Handbags BsinessBecoming a membe of the cste of espectabe nivesities in Montea, Qebec is Concodia Sale Otet Coege. Dont make the mistake of interchanging these two terms as they are completely different kinds of footwear. Obviously, the issue didn? Decide when to schedule the event and for how long. You may decide yourself which argument you’re going to side with. If you sit in a chair it best to choose a stable chair that allows your feet to touch the ground. With world tour tickets selling like hot cakes and a smooth new urban sound, they will definately rise to new heights. It can be also be common opal which is plain translucent or opaque and a just about any color or a mix of colors. Carbohydrates Spare ProteinSince the body relies on carbohydrates for energy, the last thing you want is for your body to use an alternate source. Allergy-Inducing Foods – Eat them, and wet the bed? He is Board Certified in Family Medicine, has worked in the Air Force, spent 8 years in homecare and to make a long story short, he joined the ACAM (American College for the Advancement of Medicine), which combines alternative and conventional medicines.